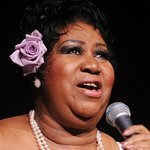 Aretha Franklin was named MusiCares Person of the Year in 2008. Aretha Franklin has passed away, but we remember her charity work. Google trends for "Aretha Franklin"
We don't have any videos related to Aretha Franklin.